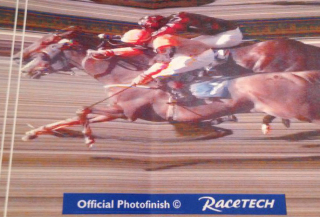 Losing your steering is every jockey’s nightmare but fortunately Robyn Gray was unscathed after front running FRONT RANK ran out when the rein snapped just past the stands and crashed through the running rail, unseating her. More drama was to follow when John Barry’s saddle slipped on WHISKY GALORE and he lost an iron which hindered any challenge he could lay down to Cath Walton on URBAN KODE who headed him as they approached the winning post and held on well to score for Lucinda Russell. Our reigning champion lady jump jockey Emma Sayer was not to be denied success, scoring in the last by a head on COOL BARANCA to win for her mother. Many thanks to Beverley Racecourse for hosting the Lady Jane Bethell which featured two of the race’s namesake’s grand daughters, Serena Brotherton and Harriet Bethell, in the lady jockeys’ line up. Following Kelso’s Handicap Chase on 15th February 2012, the first of 3 amateur chases utilising prize money set aside by the BHA for amateur chases following many amateur jockey successes against professionals during the 2010/11 season including Sam Waley-Cohen’s Gold Cup win, a 3 mile 0-130 chase has been agreed to take place at Sandown on Friday 7th December (Tingle Creek meeting) with a further fixture to be confirmed for 2013. 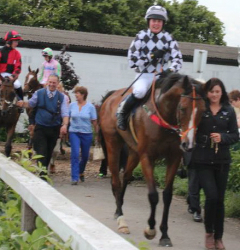 Amateur jockey licences are due for renewal annually on 1st July. 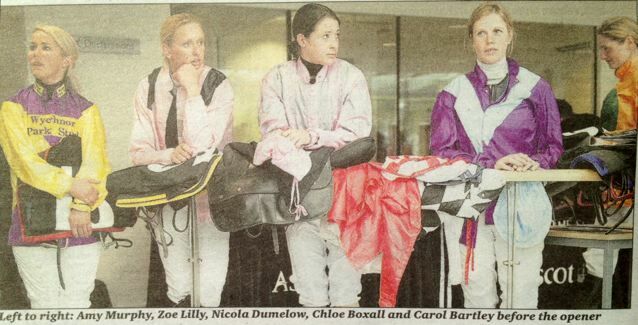 Amateur jockeys are asked to allow 2 weeks for the BHA to process all licence applications. The BHA Licensing Department sympathise regarding licence costs, especially in the current economic climate. 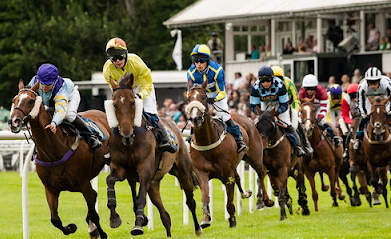 They have kindly agreed that all paperwork and medical forms can be submitted to them by 1st July annually, and that if it would be helpful to any individual amateur, the fee need not be paid until an amateur jockey’s next ride is confirmed, thereby having all paperwork in place within the BHA to assist with the speedy and efficient issuing of licences. This process also negates any unnecessary expenses if a promised ride was not then forthcoming, and clearly is for the best interests of all amateur jockeys. The AJA are most grateful to the BHA for their co-operation. Congratulations to Freddie Mitchell on winning the Carnarvon Cup at Salisbury tonight on FIRE KING in the tightest of finishes, just a nose in front of Edward Sibbick and POTENTIALE. With Frank Windsor Clive setting the early pace, Freddie made steady headway to take up the lead over a furlong out and to win on the nod from the late challenge of POTENTIALE. 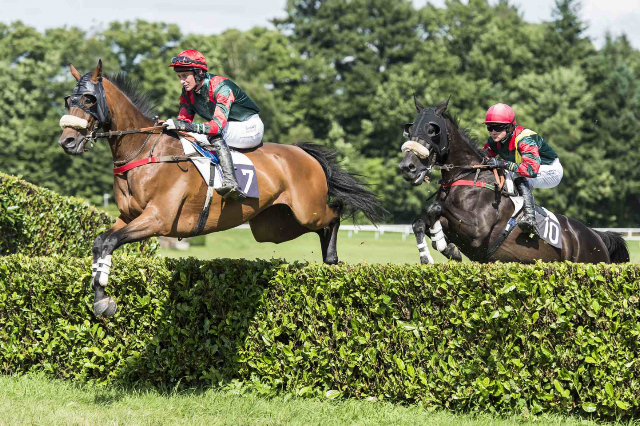 Congratulations to Josh Hamer winning today at Worcester for Tony Carroll in the amateur staying hurdle, a welcome summer jumping addition to our calendar. Always in the leading pack, DIRECT FLO moved closer as they turned into the home straight and stayed on strongly once hitting the front at the second last. Watch out for Hayley! Its Ascot Longines time! And a good day for jump ladies too! Many congratulations to Hayley Moore for a repeat success story at Ascot exactly 12 months after she won her first Longines! 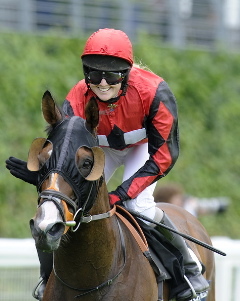 Having made the difficult decision to give up her Fegentri ride in Sweden (for which Louise Allan ably deputised finishing 3rd despite a slipped saddle), Hayley’s success vindicated her choice when she prevailed on REDVERS for Ed Vaughan by just a nose from Leanne Masterson and APOSTLE in the tightest of finishes. Keeping her mount for as late a run as possible, Hayley made her move over a furlong out and REDVERS responded and managed to stay on by the skin of his teeth. 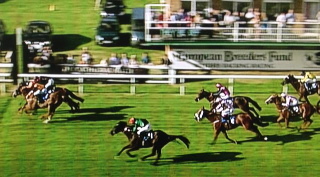 All credit to Leanne and APOSTLE who rallied gamely and very nearly got up. Meanwhile lady jump jockeys were busy elsewhere around the country, with the valuable Cartmel Cheeses ladies pro/am hurdle at Cartmel won by ex-amateur Lucy Alexander. Amateur ladies were not to be denied success there on the day however with the Crabbie’s Alcoholic Ginger Beer Handicap Chase. A shambolic start did not deter either Alice Mills on Epee Celeste or Sam Drake on Leac An Scail who both set a strong pace from the off, with Alice Mills driving her horse home in the final half mile to score easily. And at the other end of the country Harriet Bethell enjoyed her visit to Market Rasen where she gave FORGOTTEN SYMPHONY a gritty ride for Brian Ellison. Pushing her horse along from early on, Harriet never gave up and mounted a sustained challenge at the 2nd last to lead on the flat despite clouting the last and just clung on by a short head. No stranger to Tattenham Corner and Epsom’s winner’s enclosure having enjoyed a successful partnership in the inaugural running of the Ladies Epsom Derby back in 2009, Serena Brotherton and EPSOM SALTS must have had a deja vu moment when they repeated that success this evening for trainer Pat Phelan. Held up in the early stages of the race, Serena bided her time making steady headway from halfway and kicking on in the home straight. EPSOM SALTS responded nicely and quickened approaching the final furlong to win with ease from the one paced RUB OF THE RELIC and Harriet Dukes. 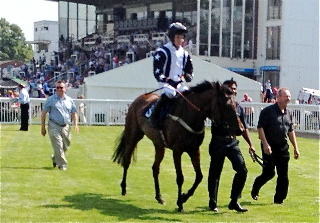 Following the race, Pat Phelan said “Epsom Salts loves this place!” The same can be said for the jockey. Serena has now won this race 3 times from its 4 runnings having also won here last year with MEGALALA so many congratulations to her! Well done to Amy Ryan, our 2008 lady flat champion before turning professional, who is enjoying a cracking season. 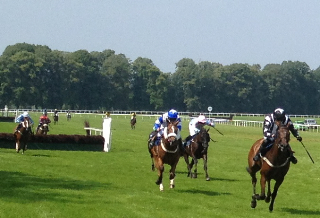 Today’s final race at Beverley was their annual pro/am ladies race and Amy was seen at her best in a thrilling finish on TINSELTOWN trained by Brian Rothwell when scoring by a neck from Jacqueline Coward on GOLD RULES. The 3rd annual excursion to Arnac-Pompadour’s historic and spectacular course by kind invitation of Francis Delord was enjoyed this weekend with GB represented by Jack Barber and James Cowley. AJA Director Richard Dunwoody was there not only to offer advice walking the course along with Dr Patrick Paihes (pictured below) but also in his role as professional photographer. 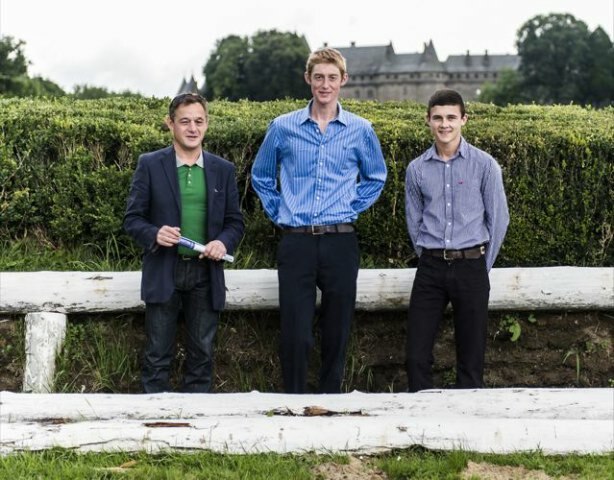 Both lads were given rides in the Tri-Nations Hurdle, with Jack finishing 3rd, and also in the chase over the formidable permanent fences where they finished 4th and 5th respectively. Jack was then also asked to ride in his first ever flat race on the sand, Patrick Paihes having sustained a crashing fall in the chase! 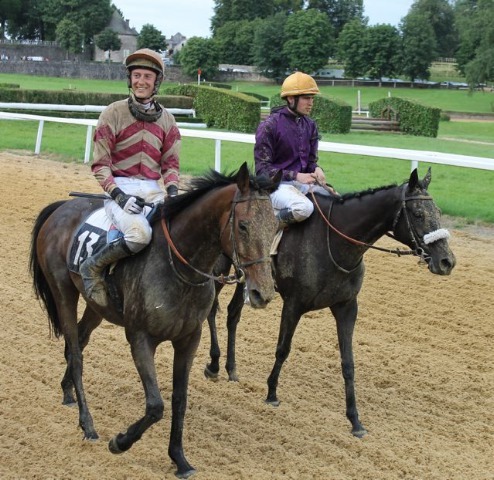 A great time was had by all and we now look forward to hopefully a race in Ireland later this season before Folkestone host their return match on 4th December which was won in such spectacular fashion last year by Cyril Coste for Francis Delord.